Ireland today has a new Michelin starred restaurant. Massive congratulations to Heron & Grey, Blackrock for achieving one star status, announced today at the Michelin Guide Great Britain & Ireland ceremony at the Savoy, London. Heron & Grey have been praised for their ‘quirky, innovative and original’ cuisine, which is heavily seasonally driven with the menu changing on a bi-weekly basis. Andrew Heron manages front of house and Damien Grey is the head chef. 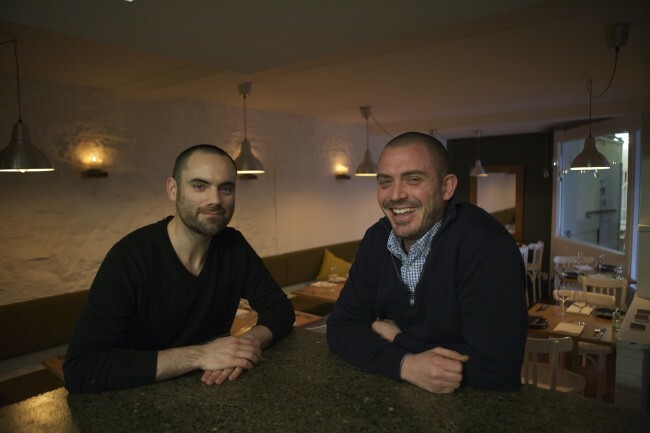 Andrew and David, having worked in the kitchens and dining rooms of Dublin & Australia for the past 15 years opened in the space which was formerly Market Canteen , with a simple mission of providing guests with the very best sourced produce and delivered in a relaxed atmosphere. To book Heron & Grey, click here but be quick! “Heron & Grey is a unique dining experience focused on serving modern international cuisine using only the best seasonal ingredients available to us. Our menus change as the seasons do, to consistently maintain quality, freshness and creativity. We will be taking new reservations in March of 2017. These bookings will be for the months of August,September, October and November. All bookings can be made via our reservations page which will be live on the first week of March for 3 days only. (1st,2nd and 3rd of March 2017).